At the age of 18, Gary Grosenbach was washing cars at an area car dealership. During one of his regular shifts, the mechanic for the dealership quit, and they asked Gary to fill in. 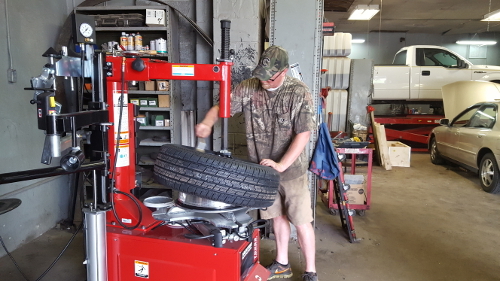 Having no experience, but an interest in working his way up, Gary took the offer, and continued working there as a mechanic for the next 3 years. When his time at the dealership was finished, Gary took a job as the assistant manager of the local Midas. After a short while as the assistant manager, the store manager left the company, which allowed Gary to move up to the position of Store Manager. He worked as the store manager of Midas for 21 years. Gary decided it was time to strike off on his own, and opened Grosenbach’s Auto Repair with his wife, Shug. When you bring your vehicle to Grosenbach’s Auto Repair, you are supporting a local, family run business, and can have the peace of mind that only the necessary repairs will be completed. Bring your vehicle in to see Gary and the guys, and if you’re lucky, you may catch Shug and Isabella (Izzy) too!